I remember one of my professors in Rome discussing the possibility of life on other planets and he said: of course, the Church does believe in extra-terrestrial intelligent beings and we call them the angels. Today we celebrate the feast of the angels, especially the three great Archangels of the Bible: Michael, the leader of the Heavenly army and our protector against evil; Gabriel, who brought good tidings to Zechariah and Mary; Raphael, who healed the older Tobias of blindness and protected the younger Tobias on his journey. Some Christians are embarrassed about belief in angels but, as one writer put it: to deny the angels amounts to tearing every second page out of the Bible. They can indeed be found throughout Sacred Scripture – from the angel of Paradise to the angel of the Apocalypse, from the angels descending and ascending Jacob’s ladder to the angel who sets St Peter free. Angels really exist. They’re not cute or cuddly, like the cherubs on Christmas cards, but awesome and powerful. Throughout Scripture, the appearance of angels results in fear and respect. There are good angels and bad angels. Each of us experiences a constant struggle against temptation and sin. This is part of a great cosmic battle between good and evil, fought not only in the battleground of our souls but between the two invisible armies of angels and devils. We can’t fully understand it. But we can be assured that the good angels are much the stronger and that they constantly protect and enlighten us. All we need to do is to be aware of this great battle and to use the spiritual armour that God has given us – especially that of prayer and the sacraments. 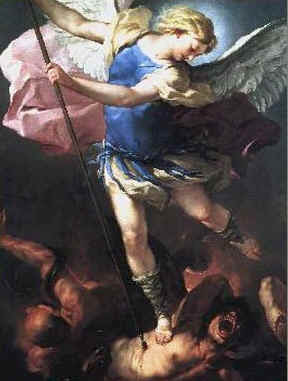 Holy Michael, the Archangel, defend us in the day of battle. Be our safeguard against the wickedness and snares of the devil. May God rebuke him, we humbly pray; and do thou, O Prince of the heavenly host, by the power of God cast into hell Satan and all evil spirits who wander through the world for the ruin of souls. Amen. Thanks to Father for this very timely post. I suppose to many of us the word "Michaelmas" is a reminder that the long vac is over. The new academic year will soon begin. And good intentions regarding our reading list have been forgotten. I'm sorry to see that in recent years the mention of angels has been more or less dropped from catechesis in our schools. This seems to me an unfortunate development. How then are children to understand that beautiful prayer, the Angelus ? Who is the Angel of the Annunciation ? Why is that ancient hymn of praise, the Gloria, known as the angelic hymn ? Why do the Prefaces mention the ranks of angels in the heavenly army ? mentioned in the Roman Canon? In fact, there are so many references in the Mass to angels it is impossible to mention them all. I sometimes wonder how many adult Catholics really believe in angels. They must wonder why we pray to them, invoke their aid, and rely on their protection. And today celebrate their Feastday. How do we explain the Fall of Man without knowing of the fall from grace of Lucifer and his angels ? Why do we pray to that doughty warrior, St. Michael, to "protect us from the wickedness and snares of the Devil" ? (I was delighted to read this prayer at the end of this post). In addition to the many biblical references mentioned by Father in his post, I think of the times Christ himself mentions the angels in the gospels. I suppose the image of the cute and cuddly cherub derives from the habit of so many artists of the Renaissance to depict "putti" as a decorative motif in their paintings. An unfortunate development in the history of western art, perhaps. The "putto" seems to me to blur the distinction between the Cupid of pagan antiquity and the Cherubim. Thus the "putti" can be read as a somewhat frivolous embellishment. And there is nothing frivolous about the fight between good and evil, between the forces of light and of darkness, between the angels of God and the wicked sprits who serve Satan. Perhaps they should reintroduce the prayer to St. Michael, so unwisely discarded in the 1960s along with the other Leonine prayers formerly recited after Mass. And one need not be "idoneus" to recite it. dr peter my children say the angelus every day at their secondary school..& we say the Holy Michael prayer at home a lot! The school uses the Angelus ? The children pray to St. Michael at home ? AND you've got the Oratorians. Now that is what I call a proper Catholic life. Thank you Father Nicholas, for putting your Saturdays' sermons on the web so that I can look up what I couldn't catch live. There is one meeting of four families from my home parish in Prague which I always look forward to it. We gether in about 22 adults and childern in one family flat and have really good time. Once we talked about Angels and their misison in our life. The host mother is a judge and knows some cases abroad. Once there was a trial about evidence of the Angels. It was because one woman needed to go straightly somewhere (probably home) due to any urgent thing and that's why she had to pass one park which was known as a place of every-day-assaults on women. Surprisingly, she passed it safely. It was discussed at the trail how could she survive without any hit. The criminals said that they couldn't attack her because she was accompanied with "two men in white clothes". And the woman acknowledged that when she had entered the park she started to pray to the Guardian Angel, but couldn't see anybody. Then the host mother (judge) told us that one day she needed to go somewhere and had to leave her small son at home for that half an hour. When she came back she asked her son: "Adalbert, did you scare?" He replied: "Why? The beautiful woman was here with me." But his mother knew there was nobody visible. That's why there must had been and Guardian Angel. Sure, also I have experiance with my Guardian Angel. I pray to him when I walk somewhere at night and become scare. I pray to him when I need to make an agreement, especially with somebody difficult, not opened, my Guardian Angel to join the other's person Guardian Angel let us prepare for peaceful negotiation. You would be surprised how it works! And likewise I prayed to him when I used to open the church but the locks where blocked thanks to one thief's stuff put in. I prayed to him to help me to open the doors bacause I need to do so within one minut due the alarm. And it always worked! Then the parish priest said to me it was necessary to change the locks because he had problems to open it. I replied: Also I had but I always prayed to my Guardian Angel to help me, and it always worked! In the end I was surprised that the last mentioned prayer, Saint Archangel Michael, isn't known here. In my country (Czech Republic) is this pray said at most churches after the mass, followed by prayer for the parish priest or new priesthood and religious vocations. In my church, we add O Sacrament Most Holy as well. Thanks for the post, Father Schofield. Pax Christi.